human population groups come in different heights. In India and China, people are usually short. In Canada, they are relatively taller. One school of biologists says this is due to varying food availability. A recent study of pygmies, the short bush-dwelling people of central Africa, says the reason might lie elsewhere: over centuries, their bodies have learned to remain small to divert nutrition towards reproduction. But why have their bodies learned to strike this compromise? 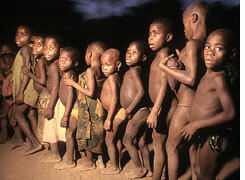 The answer lies in the low life expectancy of pygmies--they live for only 16-24 years. Their survival as a people depends on hitting puberty early and prioritizing reproduction over physical growth. This has pressured them to evolve into a shorter people. That's the outcome of research by three anthropologists of Cambridge University, who studied how physical growth (height), fertility and mortality interact among pygmy populations. They compared pygmies from Africa and the Philippines to tall populations with poor nutrition in low-income groups in the us as well as the Maasai and Turkana people of eastern Africa. They found the pygmies stopped growing at an earlier age; they also had high mortality rates and, consequently, shorter life expectancy due to reasons that include poor nutrition, the stress of living in a tough terrain and tropical diseases. Short life expectancy means early reproduction is naturally preferred. Since food availability is limited, the body diverts energy from food to reproduction rather than physical growth. Hence they stop growing at an early age. "This distinctive feature of pygmies is just a side-effect of evolutionary pressures that favour early reproduction, and not because shorter size is an advantage," commented Michael Dunn, an anthropologist with the Max Planck Institute for Psycholinguistics in the Netherlands. Since science has not yet understood the evolution of the pygmies, various scholars are working on hypotheses that--varyingly--point at poor nutrition, mechanism to tackle starvation, and easier movement in dense tropical forests. But the pygmies living in cooler areas like Bolivia do not face such circumstances and are yet quite short. Contrarily, the Maasai of eastern Africa don't get good nutrition but are tall. The mystery of height in evolution got queered further in 2004, when a remarkable human fossil was discovered on the island of Flores in Indonesia; it was that of a mature person the size of a modern three-year-old child. It can't be said for certain if this is the trace of another distinct human species or just the remains of a modern human afflicted with a disease that reduced body and brain size. It is in this context that the Cambridge anthropologists offer the findings of their inquiry. The reception of their work might add to our understanding of how the physical environment shapes evolution. Perhaps it could explain the puzzle of the Flores fossil; the challenges of survival on islands are comparable to those faced by pygmies in the African bush. Populations with abundant food can afford to grow taller and larger, to have fewer children at a later stage in life, and live longer.